Students will learn West African Dances from Senegal, Mali, and Guinea. The class begins with a ½ hour warm-up, and progresses to energetic dancing. There are live drummers or recorded music. Clothing: Comfortable clothes, loose or stretchy. Lapa or Sarong optional, bare feet. STREET SHOES ARE NOT ALLOWED IN ANY STUDIO AT ANY TIME. This class offers a rich cultural heritage in the arts that has long been traditional sources of self-knowledge, community cohesion and spiritual communion. Come learn traditional dances, rhythms and songs from Senegal and Guinea, West Africa and at the same time explore the functions of these dances in relationship to your own life. 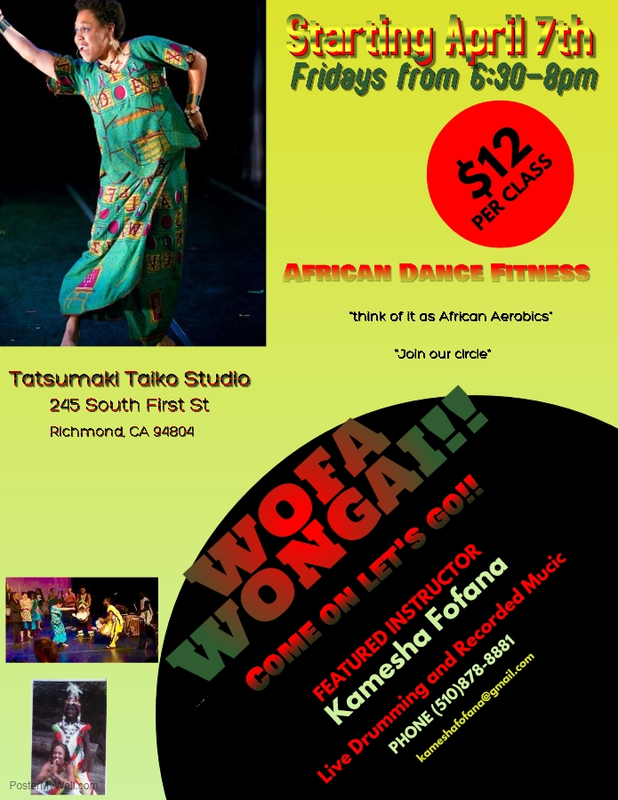 Class warm-up informs African dance technique and includes working on core strength, stretch, stamina, grounding, community building and rhythmic sensibility. Adult $12 drop-in or $40/monthly. Youth $5 drop-in or $15/monthly. Class is free for children taking class with an adult. Your positivity and passion for what you do is such an asset on planet earth right now. Thank you for your generosity and openness. Keep inspiring and know that you are deeply appreciated!